Posh players Harry Beautyman (left) and Michael Smith (right) during the club's boxing session. Photo: Joe Dent/theposh.com. Dave Robertson is more determined than ever to prove to that he is the right man to lead Peterborough United into next season. 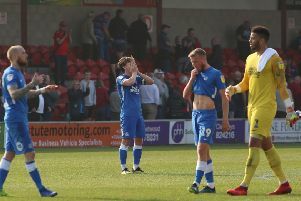 Posh chairman Darragh MacAnthony revealed this week that his commitment to manager Robertson and his coaches Grant McCann and Aaron Mclean doesn’t extend beyond the end of the current League One campaign. MacAnthony intends to hold interviews for the posy vacated by Darren Ferguson in May. Robertson, who missed out on the March manager-of-the month prize for March to Bristol City’s Steve Cotterill, will be among the candidates and he accepts that a strong end to the season is the best interview he can give. Posh have five League one matches remaining, starting at fourth-placed Swindon tomorrow (April 11) to try and force their way into the play-offs. Posh are currently 10th, six points outside the play-off places. Robertson said: “The chairman has thrown down the gauntlett to me, my management staff and the players with his statement this week, but I am hungrier than ever to get the job. “We need a strong push in the final five games to get us into the play-offs, but it’s definitely not all over for us. We all want success badly and we are all up for the fight. “Swindon are obviously a good strong side, but me and Grant McCann have watched their last two games and we will come up with a plan to try and win the three points. “We will stay more focused on what we need to do though. We have to be positive because we need the win. I’m still very upbeat about things. “We will have to earn the right to play against a team like Swindon, but then we also have to be braver with the ball when we get it. Posh winger Jon Taylor is rated 50/50 to play because of a knee problem, but Robertson otherwise has a full squad to select from. That includes the three loan players, James Pearson, Alan Sheehan and Luke Williams, who were all left out of the matchday 18 on Easter Monday. Robertson mixed things up in training this week with the players enjoying a session with rising boxing star Tommy Martin, a former Posh Academy player. Back-to-back defeats have left Swindon with very little to play for now. They are well adrift of the automatic promotion places, but have a play-off place sewn up. Swindon manager Mark Cooper, the former Posh boss, takes charge of ‘The Robins’ for the 100th time tomorrow.